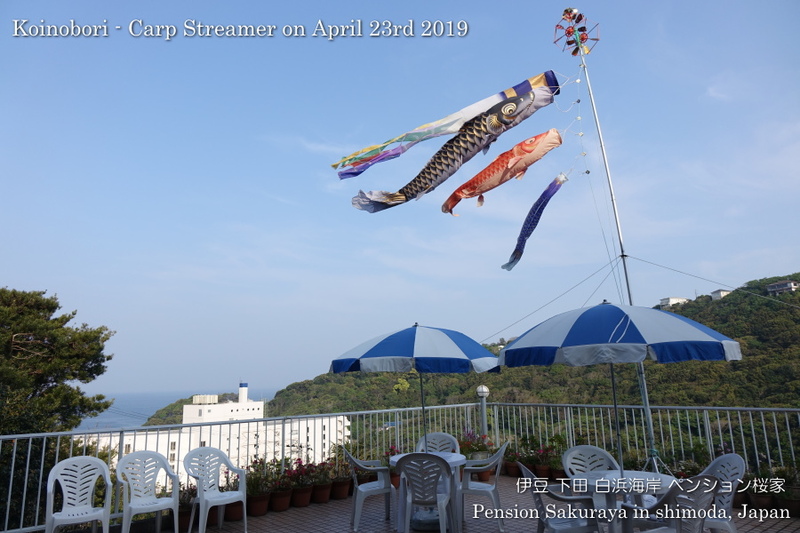 As we will have children’s day on May 5th I set up Koinobori pole yesterday. And I painted table and chairs on the terrace today. 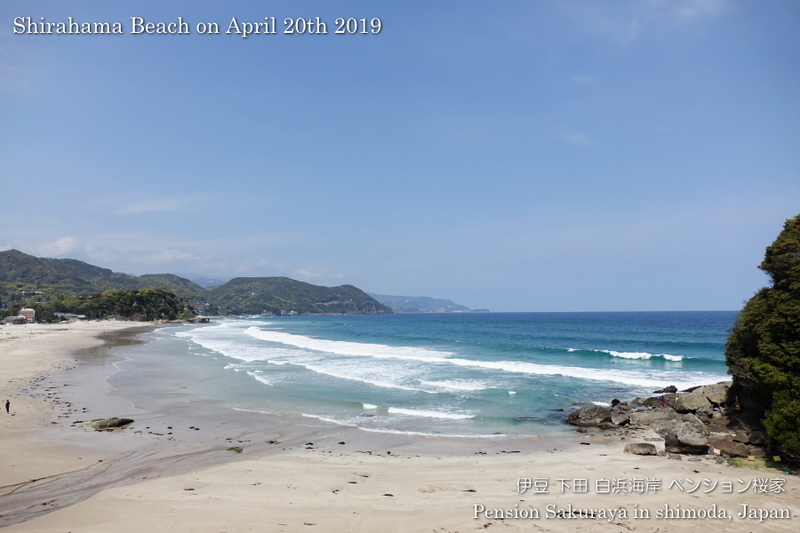 It was sunny but the air was not clear, so the water was not beautiful blue today. 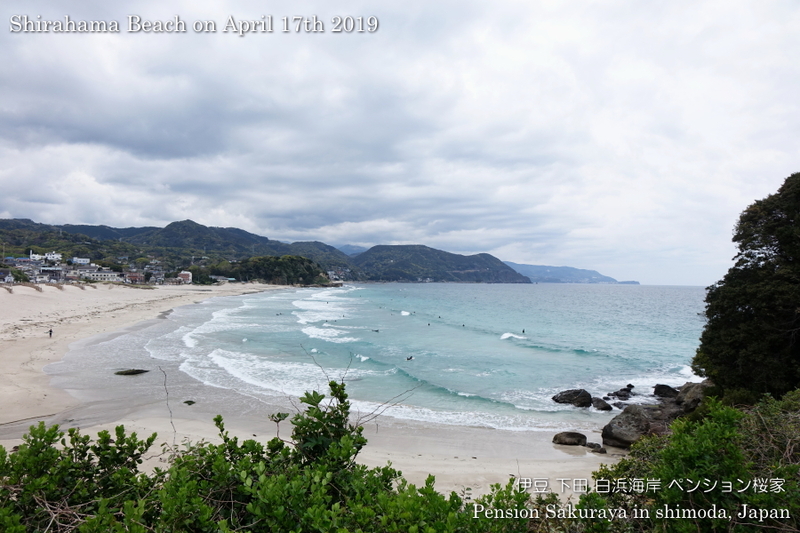 This entry was posted in beach, Pension Sakuraya, tradition on 2019年4月23日 by izusakuraya. 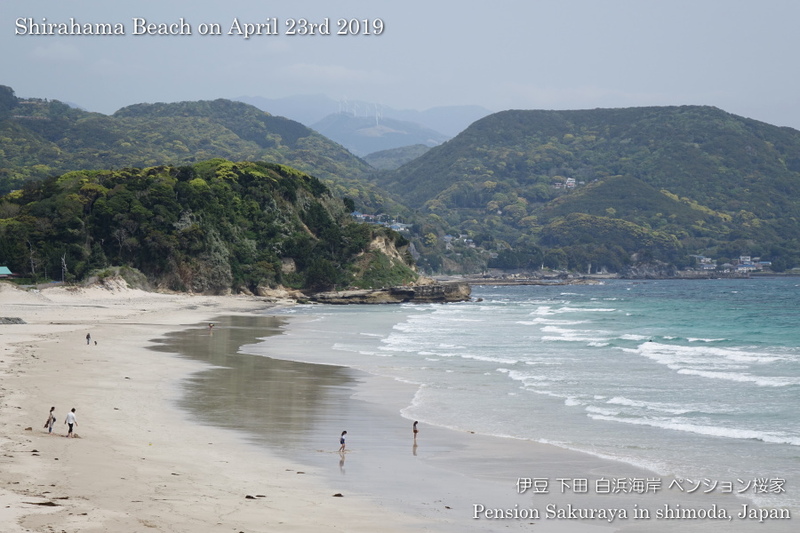 I walked on the seaside road to Sotoura beach this early afternoon. 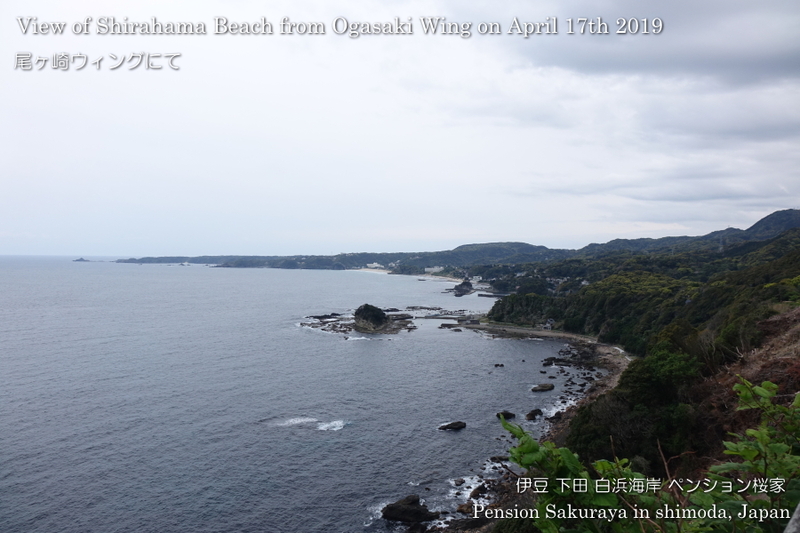 Today we had north wind but it was sunny and very warm here in Shirahama. 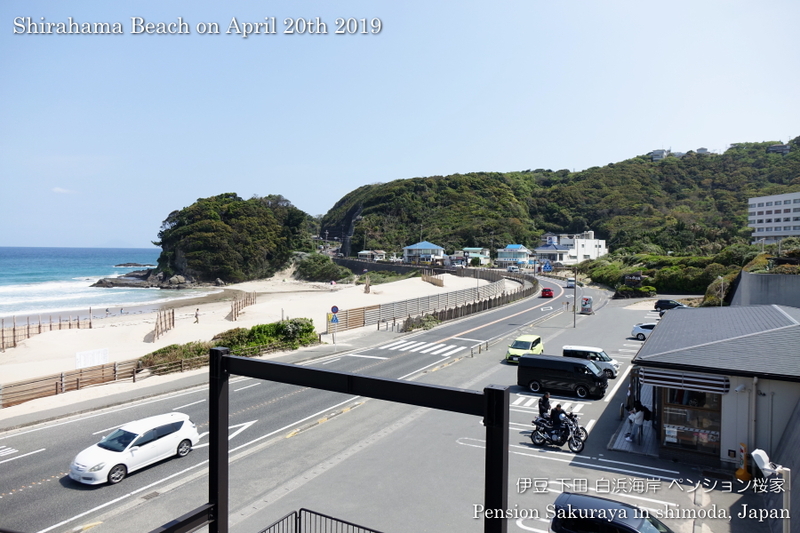 This entry was posted in beach on 2019年4月20日 by izusakuraya. He came to Japan from England for the 1st time. 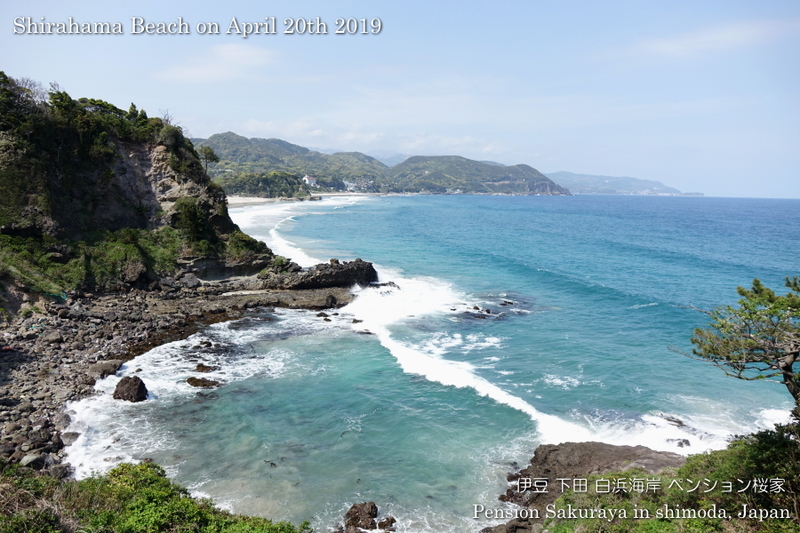 After he went to Osaka, Kyoto, Nara, Takayama and many other places he came to Shimoda. 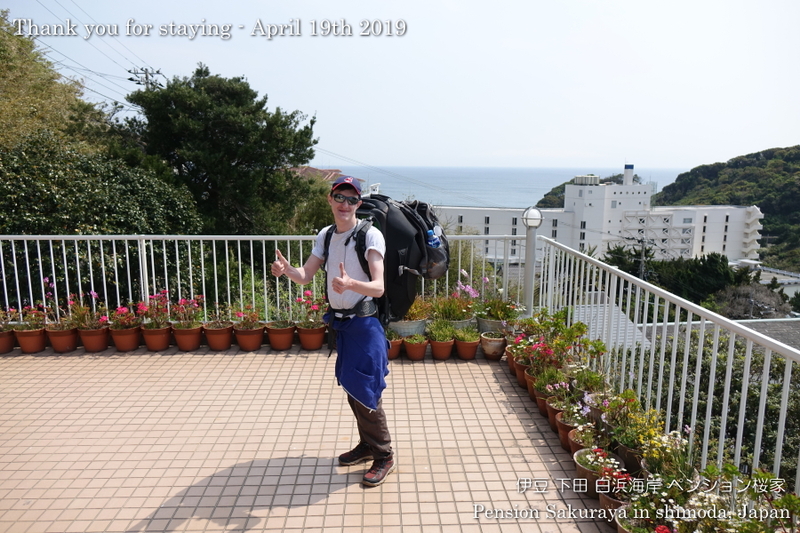 I was surprised that he had very big backpack more than 25 kilograms on his back and came to Sakuraya by walk for about an hour from Izukyu-Shimoda station …..! After Shimoda he will stay in Tokyo for one night and leave Japan. Come and Visit Japan someday again in the future. 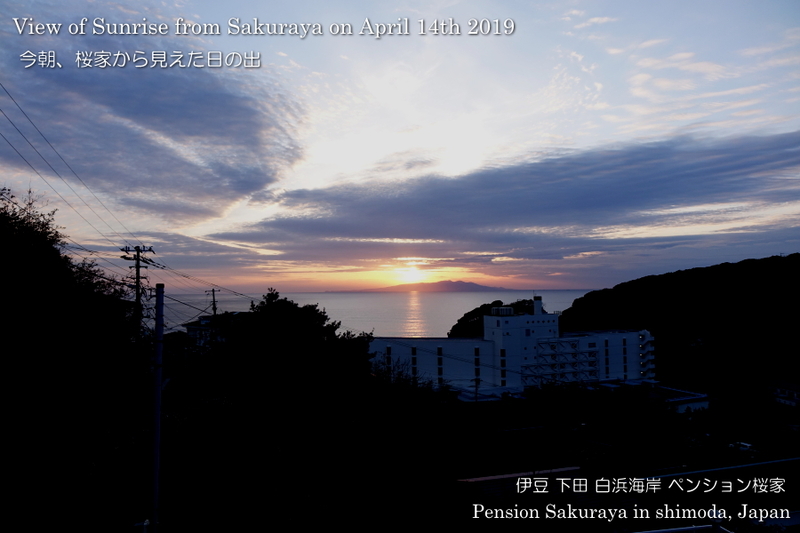 This entry was posted in Customers, Pension Sakuraya on 2019年4月19日 by izusakuraya. It was sunny before noon, but the clouds came from the western sky this afternoon. 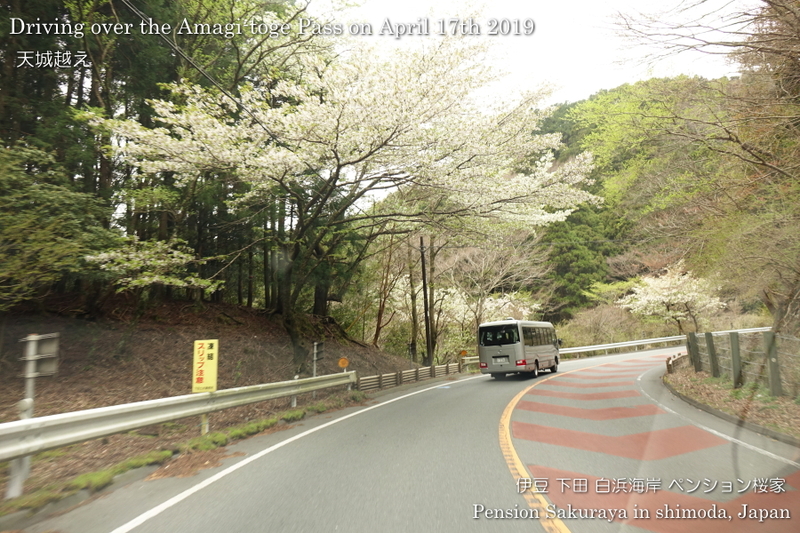 The cherry trees finished blooming and the trees have now fresh green leaves. As we have guests today I didn’t have enough time to walk. Because I had to wait for our guest’s check in…. 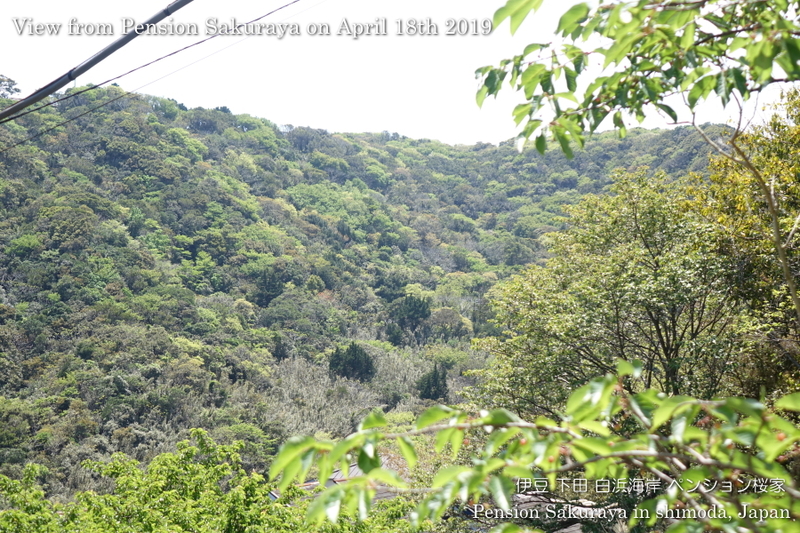 This entry was posted in nature, Pension Sakuraya on 2019年4月18日 by izusakuraya. It was cloudy today. 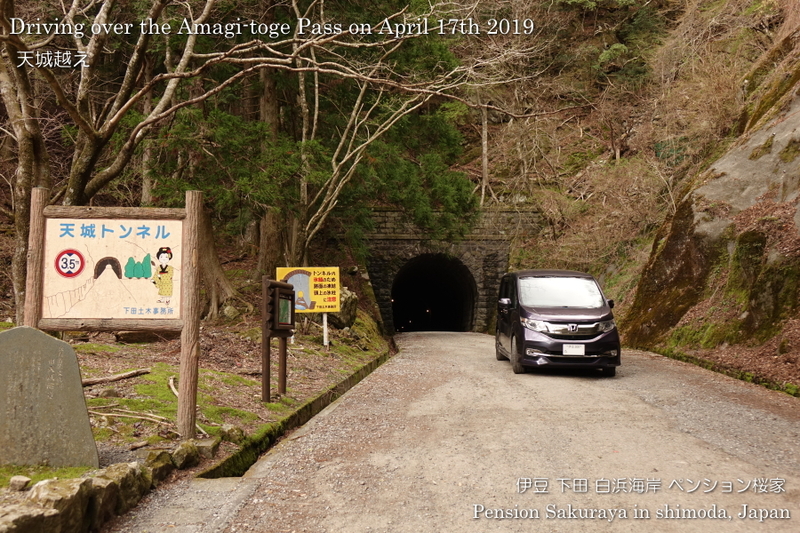 As my wife and I had to go to Ohito in Izu city we drove over the Amagi mountains. 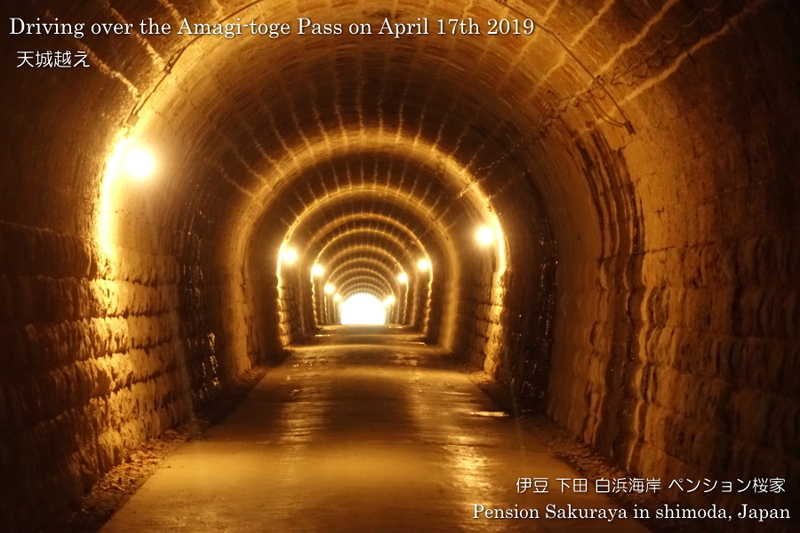 We run through the old Amagi tunnel on the way home after a long time. To tell the truth, my wife is not good at driving and also she doesn’t have confidence in herself. So she can not drive by herself on the route which she has never driven. 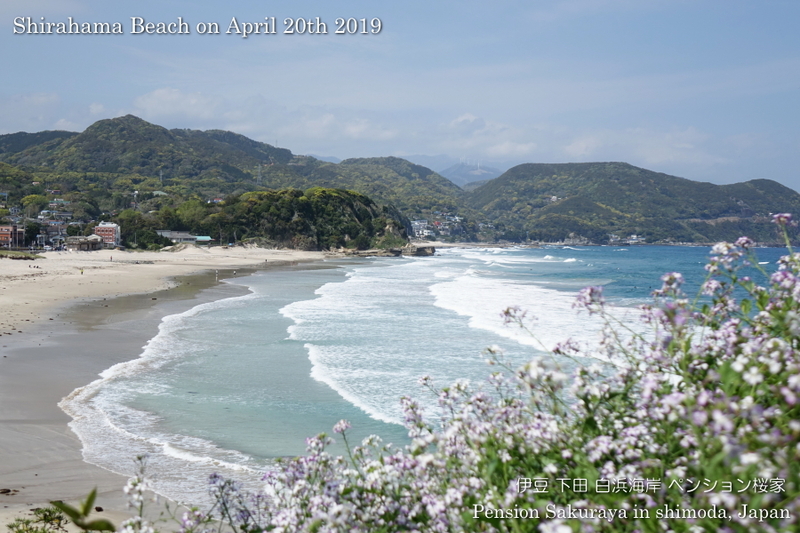 However, my son will have a basket ball games in Izu city over Amagi mountains on next Saturday and my wife will have to drive by herself. Because we will have some guests on that day and I will have to stay at our house. That’s why I drove my car to show her the route to go to the place where the games will take place….. 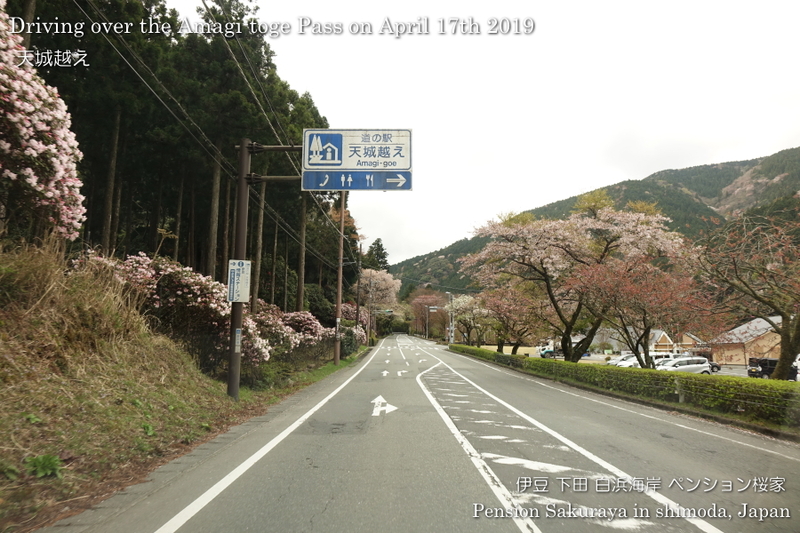 This entry was posted in Family, Flower, nature, Travel on 2019年4月17日 by izusakuraya. He is from France and now lives in Vietnam. 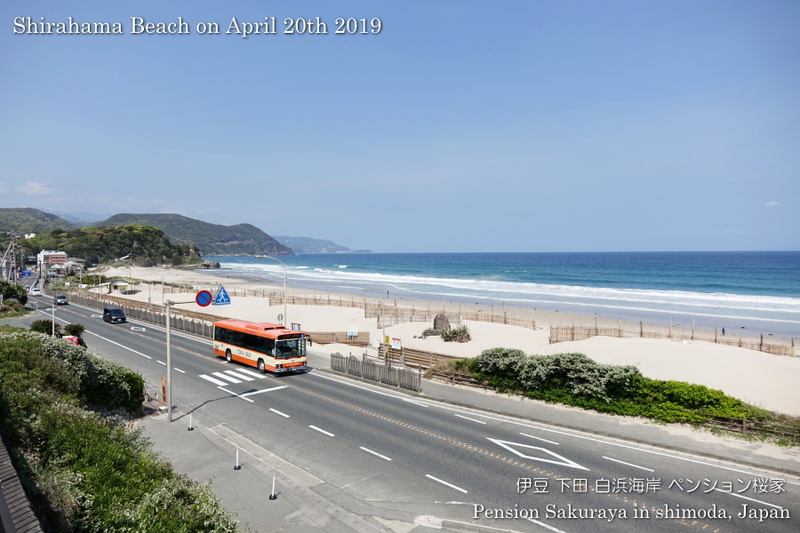 On the 1st day he went to the nearest beach after check in, and went to Irozaki cape by bus on the 2nd day. He loves Japan and comes to Japan every year. “I will come here next year again” he said when he checked out and his words made us very happy! 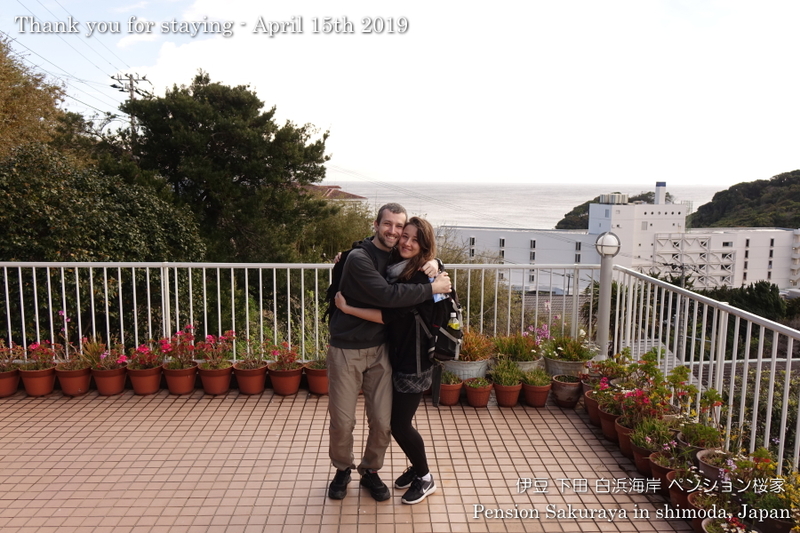 Thank you so much for staying with us and we were very glad to meet you after 5 years. We are really looking forward to meeting you next year! 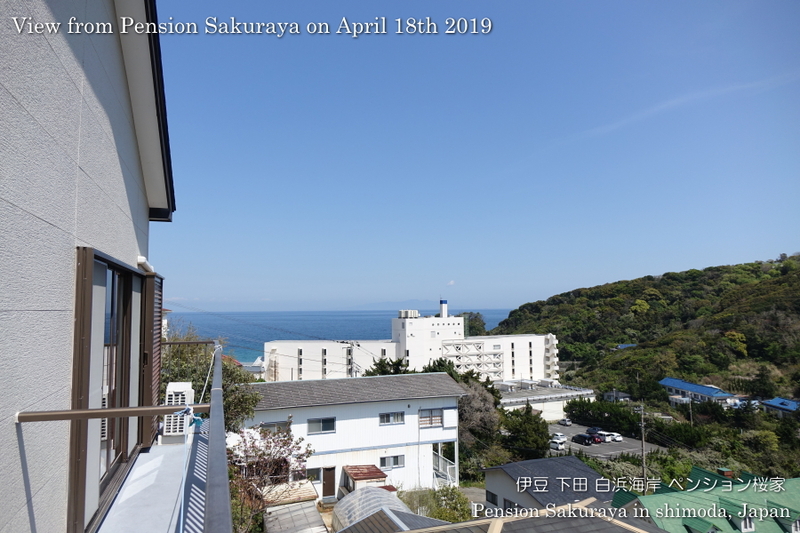 This entry was posted in Customers, Pension Sakuraya on 2019年4月16日 by izusakuraya. They came to Japan from France for the 1st time. 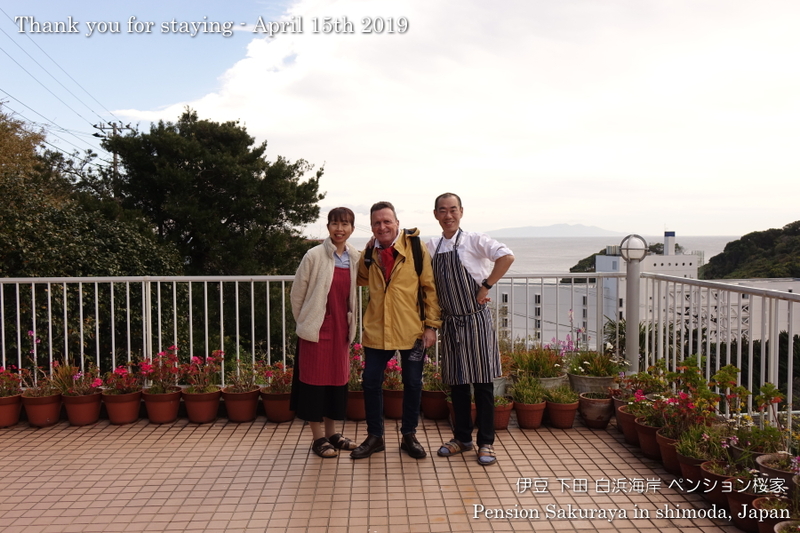 They came to Shimoda after Kyoto and stayed at Pension Sakuraya for 2 nights. 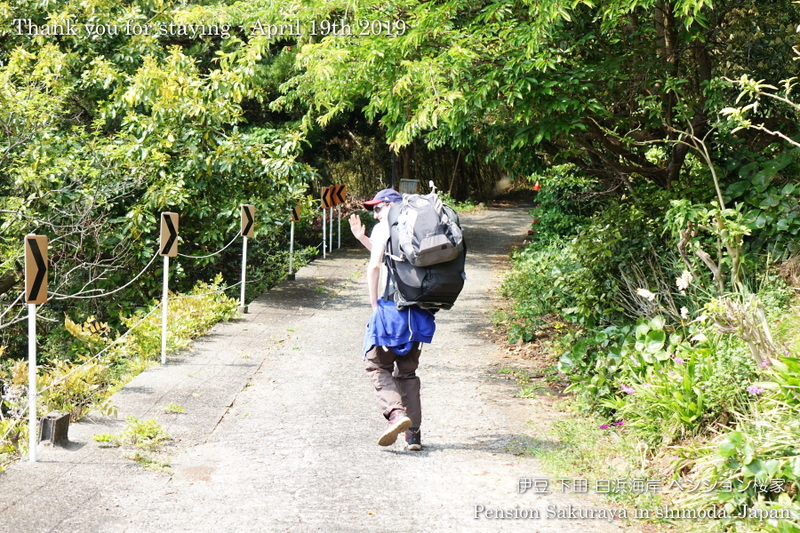 On the 2nd day they had running to train themselves before climbing Mt.Fuji after Shimoda. They are beautiful and lovely couple and we had very good time with them. We look forward to meeting you someday again in the future! 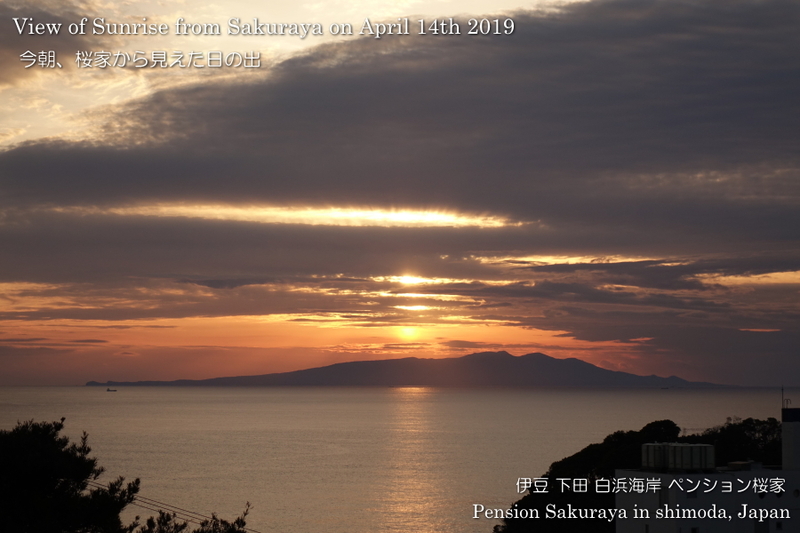 This entry was posted in Customers, Pension Sakuraya on 2019年4月15日 by izusakuraya. I took these photos at 5:30 this morning. It was sunny this morning, but it became cloudy after that. And now it’s 22:00 and raining outside. 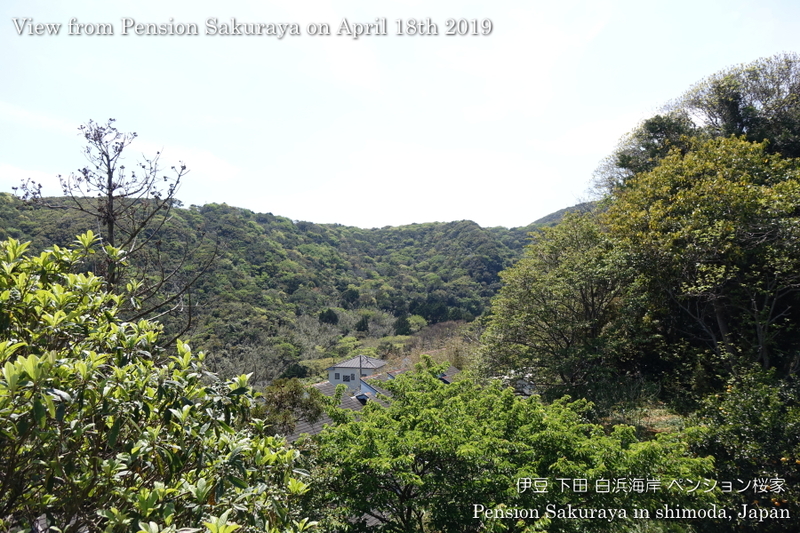 This entry was posted in nature, Pension Sakuraya on 2019年4月14日 by izusakuraya. We served this miso soup with the Japanese spiny lobster this morning, which was ordered by our guests. 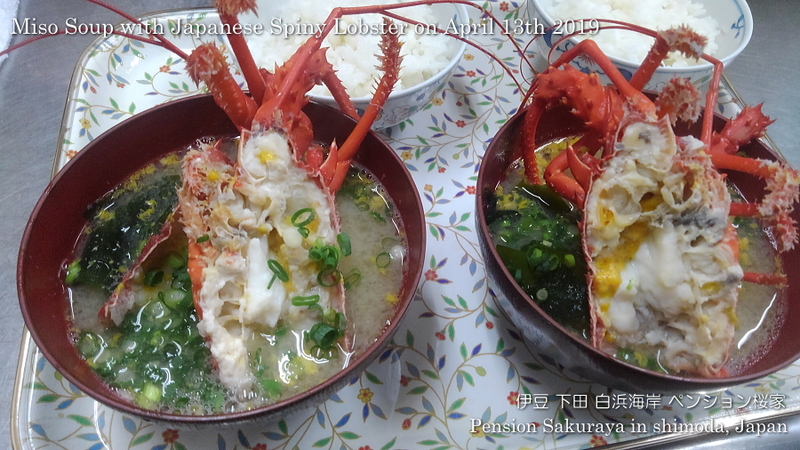 The Spiny lobster makes miso soup super delicious with good flovor! 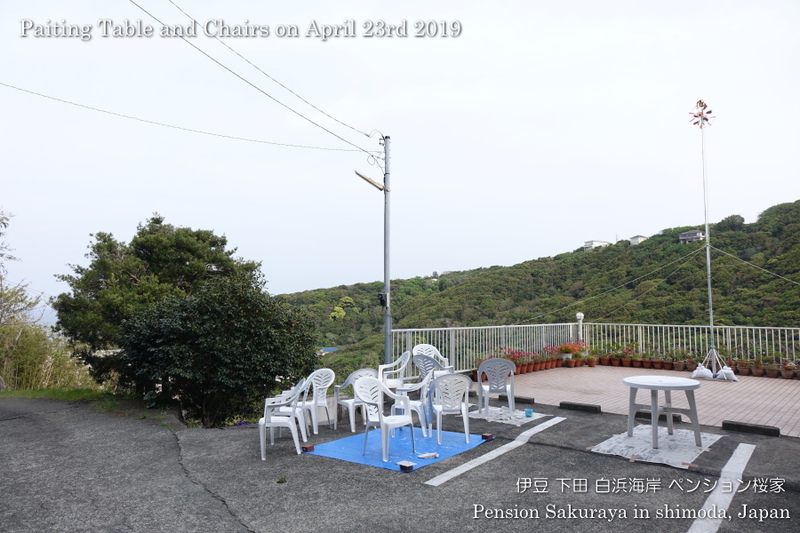 This entry was posted in Meal, Pension Sakuraya on 2019年4月13日 by izusakuraya. 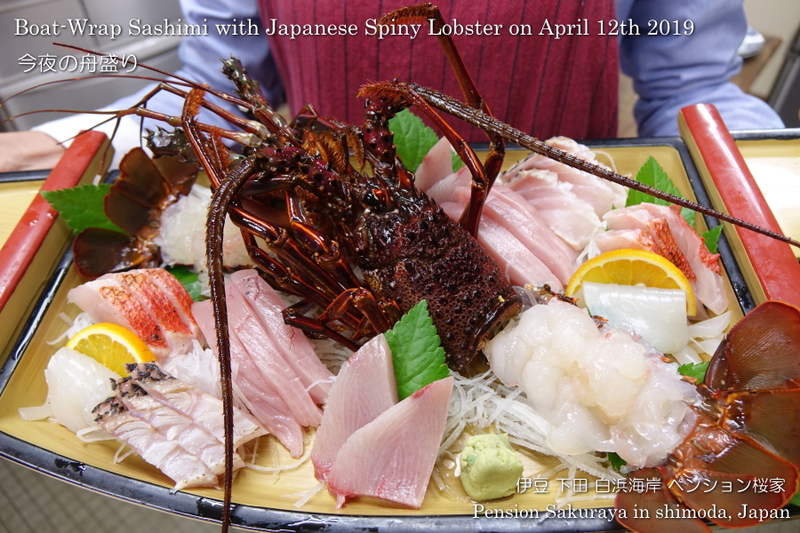 Our guest ordered this boat-wrap Sashimi with Japanese spiny lobster tonight. We will serve miso soup with this lobster tomorrow morning. 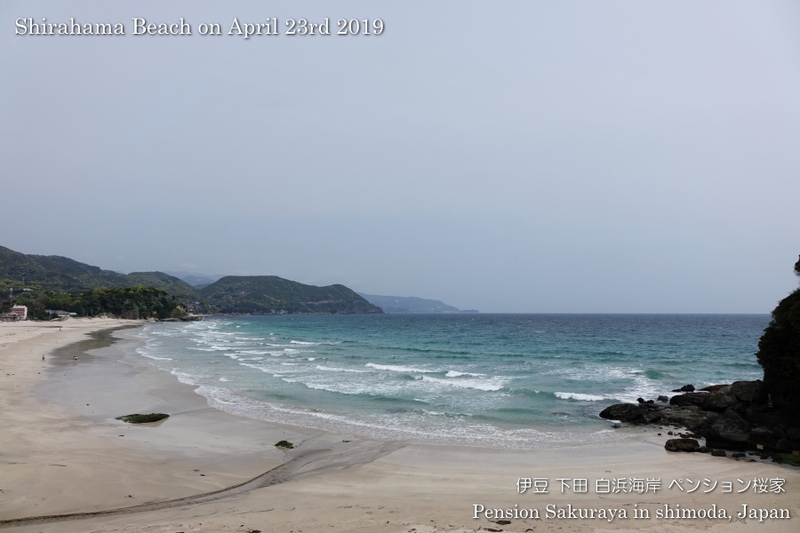 This entry was posted in Meal, Pension Sakuraya on 2019年4月12日 by izusakuraya.